So excited to try this! I am no longer eating cheese but need something to fill those cravings. I have never tried nutritional yeast, but since cheese falls into one of my favorite food categories, it sounds like I need to try it out!! I love that your healthy snacks are being passed on to Max. I feel like that it so rare these days! I just heard of nutritional yeast recently from a co-worker who says she uses it to sprinkle on her popcorn and kale chips. I meant to check into it, thanks for the reminder! Oh yum Lindsay! I've heard really good things about the nutritional yeast. Must give it is a shot! I love nooch! 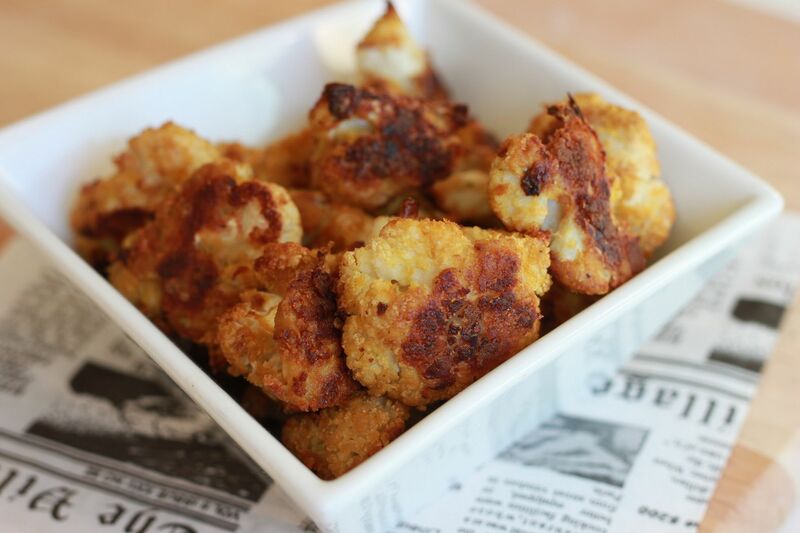 And I am loving cauliflower!!! Those look amazing!! Ok, I have to say this sounds really bizarre to me…but I'm willing to try it. haha. 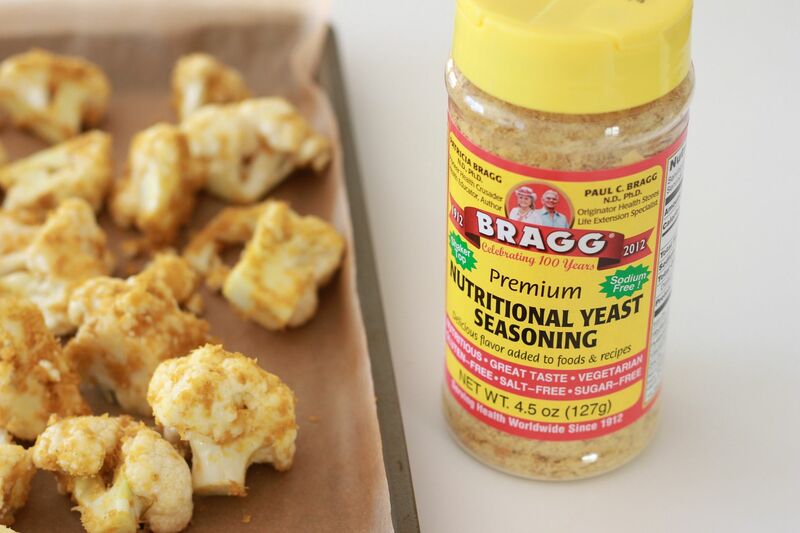 ;) I've obviously never heard of nutritional yeast…where have I been?? Oh, that's right…I live in Oklahoma. 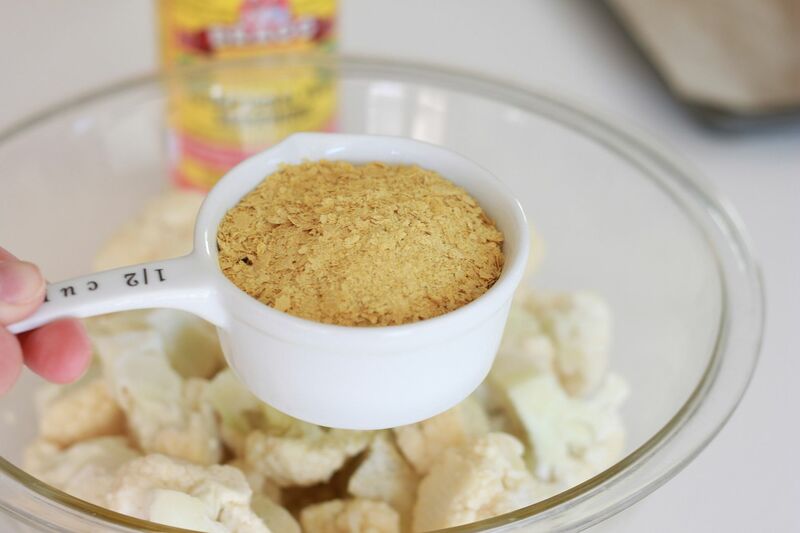 where do you buy your nutritional yeast? i looked once at whole foods in the baking aisle - no luck and i didn't have time to hunt someone down to help. Just made them and ate half the tray!!!!!!! Oh my word!!!! So delicious! Thank you so much for sharing this deliciousness! My husband loved these! I just made these as a side for dinner. He couldn't stop telling me how much he liked the flavor. It was my first time using nutritional yeast but wont be my last! Looks delicious! I must get some nutritional yeast! I am new to your blog and I am slightly obsessed with it now. Love it! Just made these and they were soo delicious!! My kids loved them which is a big compliment. I was skeptical about the nutritional yeast tasting like cheese but it does! Oh how I miss cheese so thank you for introducing me to it! Love all your paleo friendly recipes! My carnivore of a son loved these. My picky vegetarian son wouldn't touch them. Oh well, more for me. I made these tonight. Soooo good! I was surprised by how potent the smell of roasting nutritional yeast is, but the taste is superb! I made these last night and my whole family devoured them. They were awesome! They are outstanding! I am going to try them in the dehydrator next. From what I've been told, cut the olive oil in half for the dehydrator. I just made these tonight, they are delicious ! I love your site Lindsay! I've been using Nutritional Yeast for a little over a year now so I was sure I would like this recipe. And I was right! This is my new favorite snack! I wonder how these would do oil-less on a silcone baking sheet with just a sprinkle of water to help the nooch stick to the cauliflower? These are very good! Thanks for the idea and for the nudge to finally try nutritional yeast! I wanted to pass on that I wanted to lower the fat content a bit (since I knew I'd eat the whole batch!) and it came out just fine with half the oil - it actually got done in 40 min instead of 60! These are great. Made these during the week for the first time and again today, due to my 2 picky eaters request who usually won't touch vegetables. Can't wait to try more of your recipes as my oldest son was just diagnosed with type 1 diabetes. just a little note to say that i made these tonight as a side for dinner and they ROCKED!!! 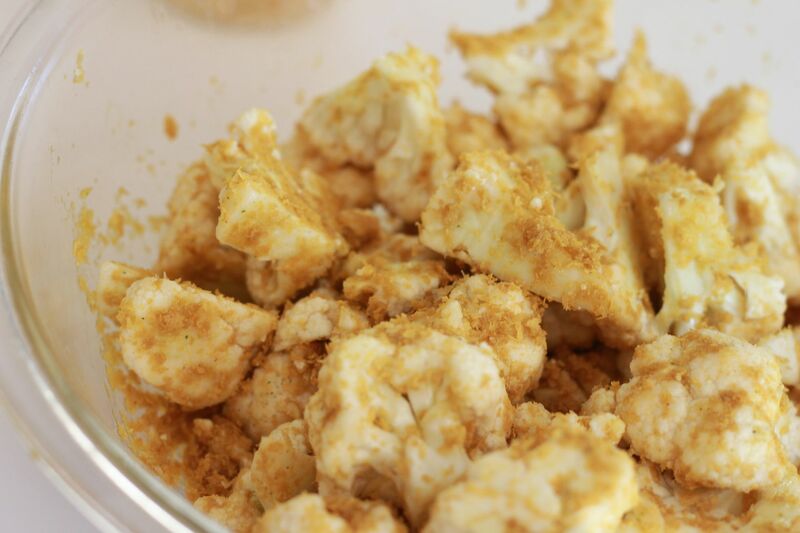 i could seriously eat an entire head of cauliflower by myself. thank you for such yumminess!!! just a little note to say that i made this tonight to go with our dinner and it ROCKED!!! i seriously could have eaten an entire head of cauliflower by myself. thanks for the yumminess! Love these !! 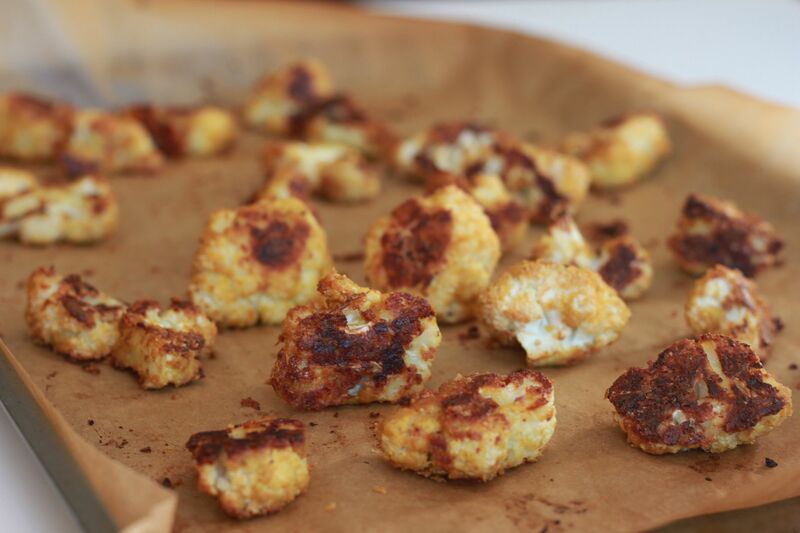 I used to hate cauliflower. My kids ask me to make these !!! I add crushed red chili to it too ! These were really delicious! A 13, 12, 8 and 4 year old gobbled them up and asked for more!